Browder J. Thompson was an American electrical engineer recognized for his contributions to the development of vacuum tubes. Thompson was born on August 14, 1903 in Roanoke, Louisiana. 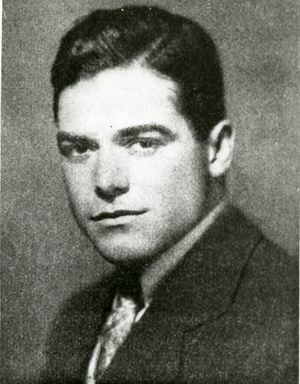 He attended the University of Washington in Seattle, where he received his bachelor's degree in electrical engineering in 1925. One year later he joined the research laboratory at General Electrics, where he designed vacuum tubes for radio and industrial use. In 1931 he moved to the RCA Radiotron Company in Harrison, New Jersey to head its electrical research. Beginning in 1942, Thompson served as co-director of RCA Laboratories in Princeton. One year later he was called upon by the Secretary of War to serve as an expert consultant and participate in a special WWII mission. Sometime between the late night and early morning hours between July 4 and July 5, 1944, Thompson was killed in action on an Army plane flying over Italy. He was observing the difficulties of air-to-ground radar when a German anti-aircraft shot down his plane. Thompson was a Fellow of the Institute of Radio Engineers and held memberships in numerous organizations including the American Physical Society, Tau Beta Pi, and Sigma Xi. In 1936, the IRE awarded Thompson with the Morris N. Liebmann Memorial Award "for his contribution to the vacuum-tube art in the field of very-high frequencies." In 1945, the IRE announced its plan to establish the Browder J. Thompson Memorial Award to recognize researchers in the field of radio and electronics under the age of 30. It was discontinued in 1997 and replaced the Leon K. Kirchmayer Prize Paper Award. This page was last edited on 19 February 2019, at 15:11.